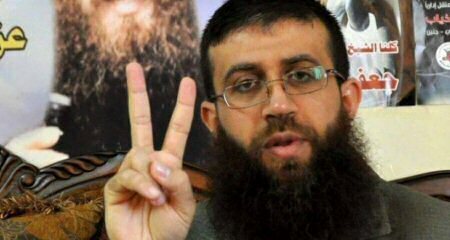 Palestinian political prisoner, Khader Adnan, is ongoing with a huger strike he started five days ago, rejecting his continued imprisonment and demanding his immediate release. Although the detainee is not currently being held under arbitrary Administrative Detention orders, there are no guarantees that he won’t face these orders. His wife, Randa, said that he informed his lawyer that he intended to declare hunger strike on the first day of his imprisonment. “His imprisonment is in itself illegal; the occupation can make up charges, or no charges at all; the detainees’ only power is the strike, to protest their imprisonment,” She said. Adnan also told his lawyer that his imprisonment is illegal, especially since Israel fakes charges to keep him in detention, instead of just holding him captive under Administrative Detention, without charges or trial. She added that Israel pressed for 21 indictments based on two main charges which he was previously imprisonment for; being a political leader of the Islamic Jihad movement and his activities in support of political prisoners. It is worth mentioning that Adnan, from Arraba town near Jenin, previously held two extended hunger strikes for being held under Administrative Detention orders. He has been in prison since his abduction on December 11, 2017.